Those that have been reading here for a while will be well aware of my total ineptitude at crafting. It's not that I don't want to do it, I do. I really do. I'd love to be crafty yet alas I own not that effusive craft gene. You'd have thought that I'd have learned my lesson by now, especially following my entry to Country Baskets 'Festive Face off' competition. Apparently not for here I am again, only this time i'm heavily pregnant with even less patience than usual willingly entering the Country Baskets Accessorize Yourself competition. Our mission was to create a wedding accessory using a selection of items sent to us from Country Baskets to celebrate the upcoming wedding season. Sounds easy enough. Never mind getting the fears knowing how strong the competition was from last time and how the other entrants could basically outcraft me without even lifting a little finger. Argh. Why oh why do I do this to myself? Then came the sheer terror of realising my inspiration had up and left. I had no idea what I was doing. As usual. So I thought a little outside the box. 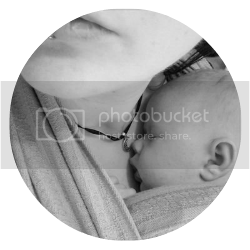 My main accessory anywhere is a child (or three and a bump) so seeing as they're my accessory I decided to make them look the part. 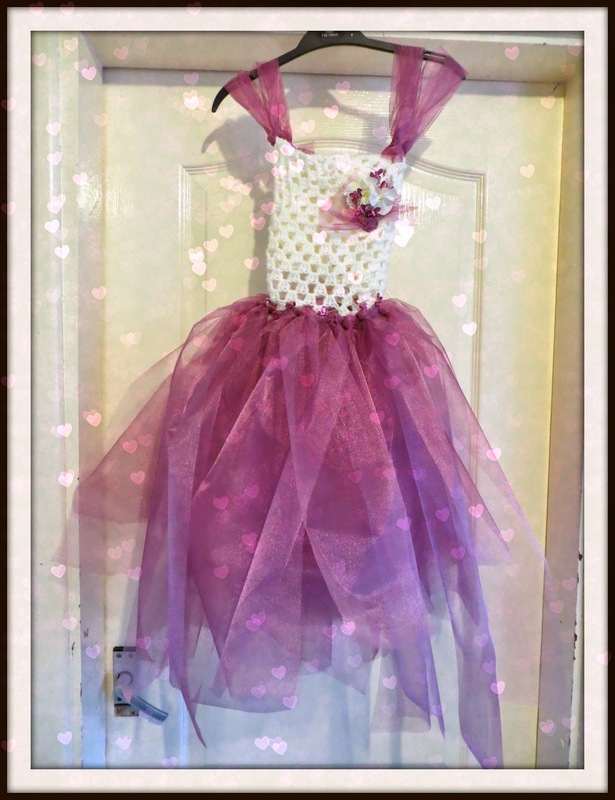 Voila, a dress fit for a wedding fairy or a flower-girl seeing as kitsch handmade weddings are growing in popularity. In addition to the items that were sent I utilised my own hook and yarn to crochet the 'body' part of the dress. 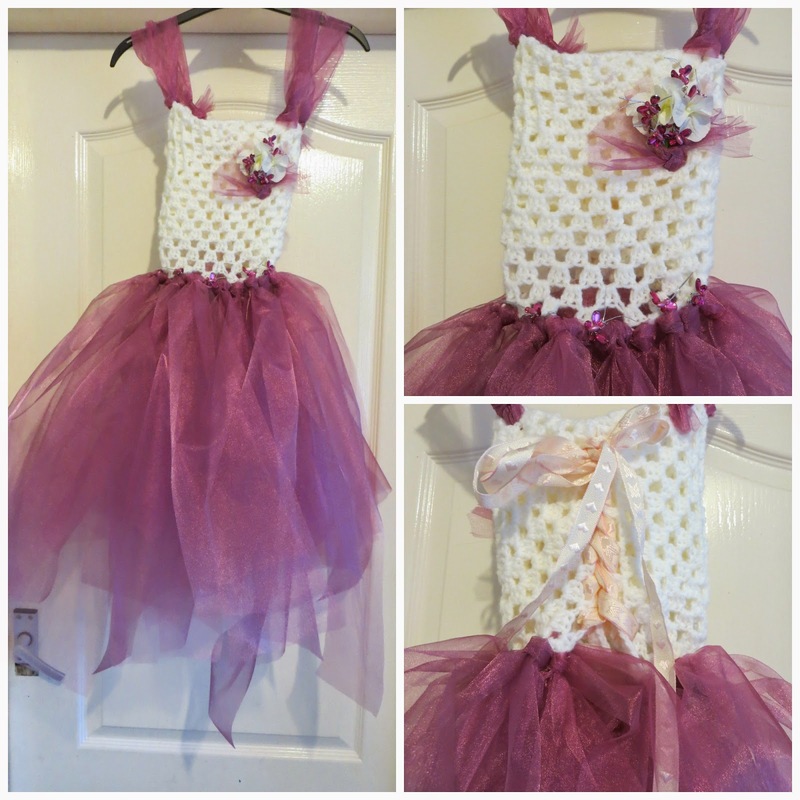 * Using double crochet I made the bodice part of the dress. Usually this would be joined as a tube top, I decided not to crochet it closed. Instead I used some of the heart printed ribbon to give a corset effect closure to the top. * I cute the voile/organza into lengths and then each length was halved length ways so the strips were narrower. * Using the no-sew method of tutu making I attached the strips to the bodice and to make the straps. * Binding together some flowers, butterflies and organza a small corsage was made and attached to the bodice. * A few butterflies were then added to the waist to marry the bodice and skirt in style.